Buddha Jayanti, also known as Buddha Purnima, celebrates the birthday of Lord Buddha. Buddha Purnima falls on the full moon day in the Hindu month of Vaisakh (April/May). Lord Buddha was born on the Full Moon day in the month of Vaisakh in 563 BC. Here, it is interesting to note that Buddha achieved enlightenment and nirvana (salvation) on the same day (the Full Moon day). Thus, Buddha Purnima also marks the death anniversary of Gautam Buddha. Sarnath holds an important place in Buddhism as Gautam Buddha gave his first sermon at Sarnath. On the occasion of Buddha Jayanti, a large fair is held at Sarnath and the relics of the Buddha are taken out for public display in a procession. According to Buddhist legend, his wife Yashodhara, his first disciple Ananda, his charioteer Channa, and the horse Kantaka on which he renounced his kingdom to ‘find some answers to life’, were all born on this sacred day. Even, the tree, called Bodhi tree, under which he attained nirvana was also believed to have been created on this day. And it was on this day Buddha chose to preach his first sermon at Varanasi, or, Benaras, in India. Hanuman Jayanti is celebrated every year by the people in India to commemorate the birth of Hindu Lord, Hanuman. It is celebrated annually in the Hindi month of Chaitra (Chaitra Pournima) of the Shukla Paksha. People worship Lord Hanuman as a symbol of devotion, magical powers, strength and energy. People read Hanuman Chalisa as it has ability to conquer the evil spirits and provide peace to the mind. The devotees of Lord Hanuman visit Hanuman temples at this day after a holy in the early morning, apply red tilak (vermillion) to the foreheads of Hanuman idol, read Hanuman Chalisa, offer Prasad of laddoo, do Aarti by chanting mantras and Aarti songs, make round of the temple and so many rituals. As Lord Hanuman was born to the Vanara community having reddish orange color body, that’s why it is seen to all the Hanuman temples having reddish orange colored Hanuman idol. After puja, people apply red Sindur to their own foreheads as a Prasad and distribute laddoo Prasad among people to get blessed with what they have prayed to their God Hanuman. Ram Navami is a famous Hindu festival, which celebrates the birth of Lord Rama, the seventh incarnation of Lord Vishnu. It falls on the ninth day of the shukla paksha, or bright phase of the moon, in the lunar month of Chaitra (April-May). Rama is amongst the ten avatars of Lord Vishnu and also one of the two most popular avatars, along with Lord Krishna. Lord Rama is considered to be the epitome of perfection, the ‘Maryadapurushottam‘, fulfilling all his duties towards both family and subjects. 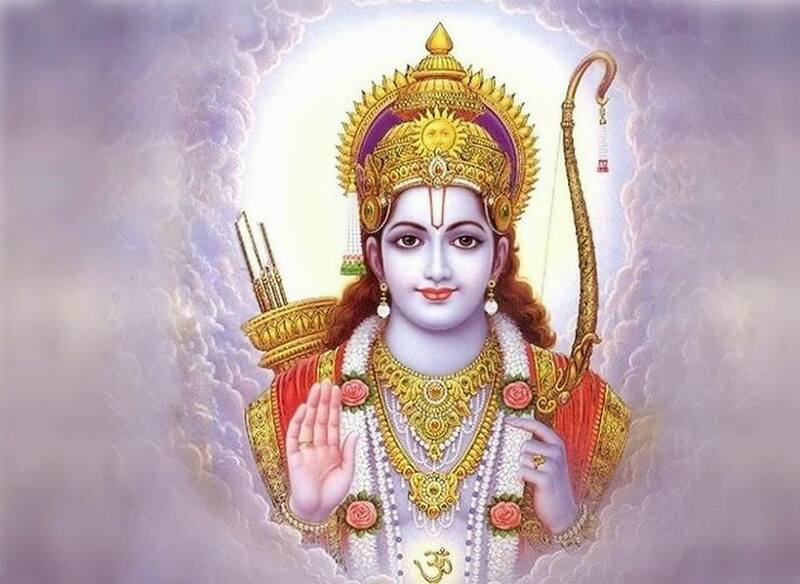 The story of Rama was first written by Vaalmeeki in about the 4th century B.C. Rama is supposed to have lived during the 8th or 7th century B.C. the epic known as the Ramayana. In some parts of India, it is a nine-day festival, coinciding with the Vasanta Navaratri (see also Navaratri). Rama was the first of the four sons of King Dasharatha of Ayodhya. When it was time for Rama to be made crown-prince, his stepmother, Kaikeyi, got Dasharatha to send him to the forest for 14 years. His wife Sita and his brother Lakshmana also accompanied him. In the forest, Sita was kidnapped by Ravana, the demon king of Lanka. Rama, together with Hanuman and the monkey army, built a bridge to Lanka, killed Ravana, and brought Sita back. Shriram‘s Name was prevalent even before His birth. After His victory at Lanka, that is, upon demonstrating His Godhood, everyone started addressing Him as Srirama (Shriram). Shriram is an example of the ideal son, brother, husband, king, friend and enemy. Shriram observed all decorum prescribed by Dharma; that is why He is referred to as ‘Maryadapurushottam‘. Also, honouring one’s word (Ekvachani) and needing just one arrow or shot to find the mark (Ekbani) and having only one wife (Ekpatni), when the norm was for Kings of that era to have many wives, are His well-known attributes. It is considered auspicious to undertake a fast on the day in the name of Rama. The objective of the fast is not to ask for special favor of the deity but to seek perfection as a human being. Devotees perform elaborate pujas and chant the name of Rama. Temples of Rama have special services and bhajan sessions through the day. One significant and popular element of the celebration is the Ramayana parayana, a discourse on the Ramayana, by a pundit or a professional story-teller. It usually lasts nine days, beginning on Ugadi and ending on Rama Navami. A skilled story-teller who can liven up the event by weaving in contemporary events attracts massive crowds. Since Rama is also one of the most sung-about deities in Indian classical music and literature, week-long (and sometimes, month-long) musical programmes are organised. Sacred places associated with Rama, like Ayodhya, Ujjain and Rameshwaram, draw tens of thousands of devotees. In Rameshwaram, thousands take a ritual bath in the sea before worshipping at the Ramanathaswamy temple. Durga is worshipped in different forms. She is a form of “Shakti“. The evolution of MahaSaraswati, MahaLaxmi and Mahakali (the 3 main forms of “Shakti”) took place from Brahma, Vishnu and Mahesh respectively. Each of these 3 deities gave rise to 3 more forms and hence in all, these 9 forms together are known as Nav-Durga. ­­Chaitra Shukla Pratipada is the first day in the month of Chaitra, Hindi Lunar Calendar. It is the beginning of the New Year of Vikram Samvat our Vedic Hindu Calendar. This calendar is based on the movement of moon and is widely followed by a large number of priests and astrologers in India. The famous Vikram Samvat is based on the day when Vikramaditya defeated Sakas and invaded Ujjain. He called for a new era. Under his supervision astronomers formed new calendar based on luni-solar system that was very much near to accuracy, was released that is still followed in the Northern regions of India. Vikram Samvat begins on Chaitra shukla pratipada also known as chaitra Navratri, the beginning of new year. Festivals like Navratri, Gudi padwa and Ugadi are also celebrated on this day.